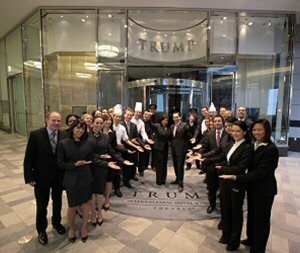 The first guests of Trump International Hotel & Tower Toronto® are welcomed with champagne and caviar. Trump Toronto executives, center, include: Inna Levitan, CEO & Managing Partner, Talon Luxury Collection and Mickael Damelincourt, General Manager of Trump International Hotel & Tower - Toronto, together with their hotel staff, unlock the doors and open for business Tuesday January 31, 2012. Today marks the opening of Trump International Hotel & Tower Toronto®, which is TRUMP HOTEL COLLECTION's™ second international venture and first foray into Canada. General Manager Mickael Damelincourt and his team welcomed guests and residents to Canada's tallest residential building with celebratory Champagne and caviar, a nod to the hotel's design inspiration. For room and event reservations at Trump Toronto, call 855.88.TRUMP (87867) or visit www.trumptorontohotel.com. For residential condominium sales information, call 416.214.2800 or visit www.trumptoronto.ca. To view the photo associated with this press release, please visit the following link: http://media3.marketwire.com/docs/TrumpInternational.jpg.